Every young boy imagines himself as a fighter pilot. As kids, we used to run outside with our arms stretched like airplane wings while making engine noises. As adults, we stand on the mirror side of our aviator sunglasses and imagine the reflection is Tom Cruise’s character “Maverick” in Top Gun. And just like that, that little boy dream turns into a bucket list desire. So, imagine my horror when I almost missed out on both. I’m 195 miles southeast of Paris, France, in Dijon known for its Burgundy wine and mustard. I’m knocked out in my hotel room, hugging my pillow, exhausted from traveling 14 hours the day before, when my phone rings. Anyone who has heard that ring knows the terror of being late, but Kate, with her calm British accent, let me know everyone was outside waiting and I had exactly 15 minutes to get ready. I frantically surveyed the room, took a deep yogi breath, and then rushed into the bathroom to brush my teeth, get dress, pack my bag and make it downstairs into the van. Kate is a rep for Breitling, the Swiss watch company founded in 1884, famous amongst pilots for their Navitimer watches. 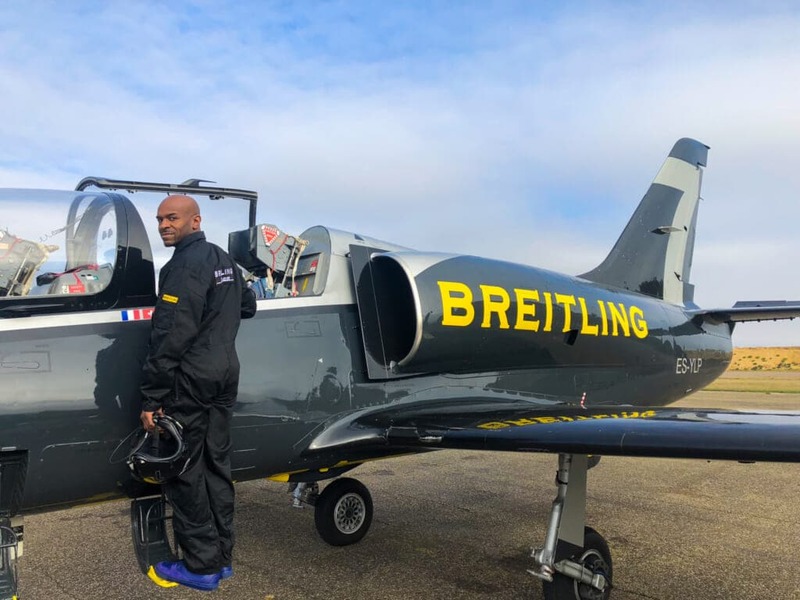 As a Breitling Brand Ambassador, I was invited to Dijon to fly with the Breitling Jet Team, who happened to be the largest non-military flyers in the world. 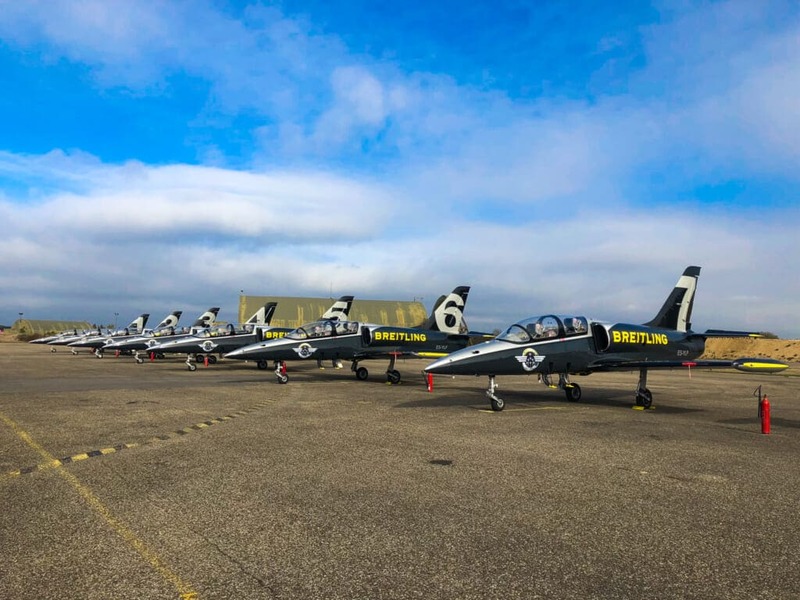 They perform their aerobatics in L-39C Albatros, Czech in twin-seater military training jets. As we pull up to the Breitling hanger a rush of energy comes over me. I’m the first one to hop out, of the van, run to the fence and gawk at the immaculate black, anthracite and metal gray livery painted jets parked on the ramp. I’m just a kid from the South side of Chicago and this moment feels surreal; but first, I need to record an IG Story video because if it’s not on the gram, it never happened. I’m welcomed into the Pilot Club’s social club which is decorated with Breitling’s signature blue and yellow colors on the walls amidst photos of their jet teams taken from around the world. I shake hands with my pilot Patrick “Gaston” Marchand, a former French military pilot who has flown with the team since 2005. Patrick informs me we’re flying together in jet#7 and tells me to do what I love to the most—eat. I stuff my face with croissants and drink coffee to make up for missing breakfast, but the bigger reason is to combat possible air sickness from the G-forces (G’s) I will encounter during the flight. 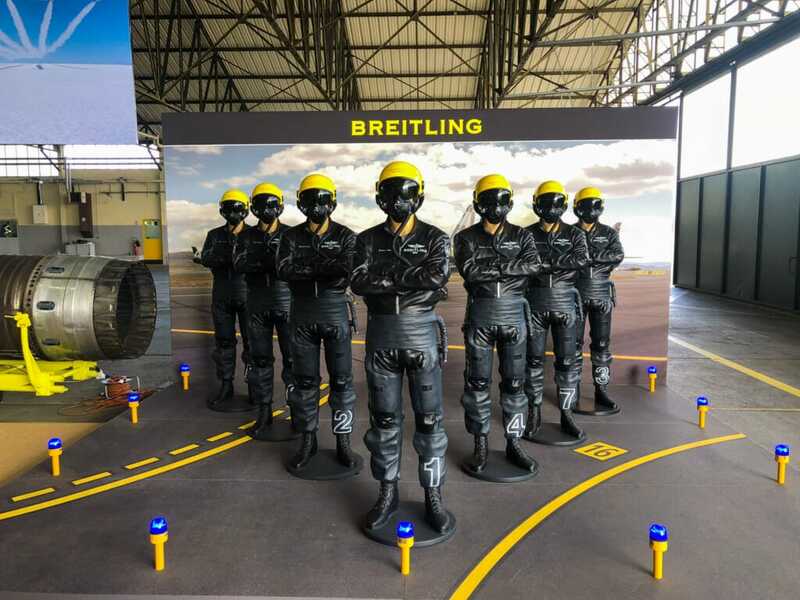 We move to the Survival Room and receive our black, pilot jumpsuits. Pulling up zipper makes me feels like donning a graduation cap and gown and once I’m fully in it, I let out a long sigh of gratitude. The final piece of the outfit is my yellow pilot helmet with its retractable sun visor and two-way radio. I look in the mirror, and yup, that’s me, the chocolate version of Maverick. Fully suited and booted, we watch a safety training video and the most important part covers how to safely eject in case of an emergency. Eject!?!? Uh Oh, this just got really real! At this moment, my excitement takes a pause and I pay close attention to every safety detail. I also learn about the flying formations and how to prepare for the 5 G’s expected during the aerobatic maneuvers. During certain points of the flight we will fly away from the Earth and the gravitational force will create pressure five times my 192lbs. weight in my body. The remedy is to squeeze my core and blow short breaths when I start feeling heavy, otherwise the G’s could cause me to blackout. Gaston and I finally proceed to the ramp and we’re greeted by his jet’s engineer. He helps me climb into the cockpit, secures my safety harness, plugs my helmet into the plane to communicate with Gaston, and points out that the ejection button is active. He instructs me to keep my hands placed on my safety harness the entire flight. The cockpit is a tight space with various buttons and gauges on the console that are equally important and foreign to my eyes. While Gaston and the engineer cycle through their safety checks, I’m overwhelmed with bucket list joy rotating my head at 180 degrees so I can take in every moment. I’m seconds away from flying in a Breitling fighter jet while wearing a Breitling pilot watch. I sit enthusiastically waiting as jet #1 starts the taxi procession down the runway. We bring up the rear like the last person in a second line parade. Gaston asks me one last time if I’m ready, and I excitedly respond, ‘Yes!’ At that moment, all seven jets take off simultaneously into Dijon’s airspace. The takeoff was swift and smooth. We climbed to elevation, cruise through the clouds at 466 mph then speed into a loop and “B One” band. Essentially, we do a backflip ascending perpendicular to Earth’s surface. It feels like I’m inside an iPhone slo-motion video, while I gaze upside upon the panoramic view below me. Here comes those 5 G’s, so I engage my core and puff short breaths. It worked! I don’t black out or vomit. I roar in excitement and marvel at the artistry of all the planes flying with synchronized precision. As we come out of the loop, we reach a breakneck speed of 565 mph and go into a dive. Gaston is really having fun. He playfully checks in to makes sure I’m ok, then flips the script and flies us into a 360 degree circular spin, turning like a combination lock. As we level off, I look over to my right and exchange fist pumps and Kool-Aid wide smiles with the other Brand Ambassadors. This is the ride of my life, and if I missed anything the first time, no worries, because we circle around to do it again! After 30 minutes in the air we return to the terra firma. 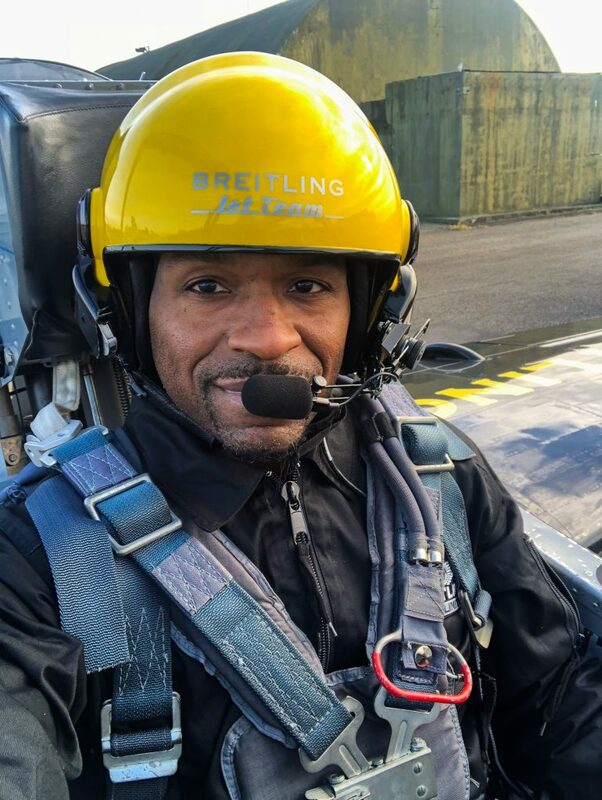 “Although my feet are on the ground, my head is still in the clouds,” said Nate Fluellen about his flying experience. Although my feet are on the ground, my head is still in the clouds. I just lived every boy’s dream (for that matter, every grown man’s dream.) For 30 minutes today, I was a fighter pilot thanks to Breitling—and thanks to Kate for waking me up. 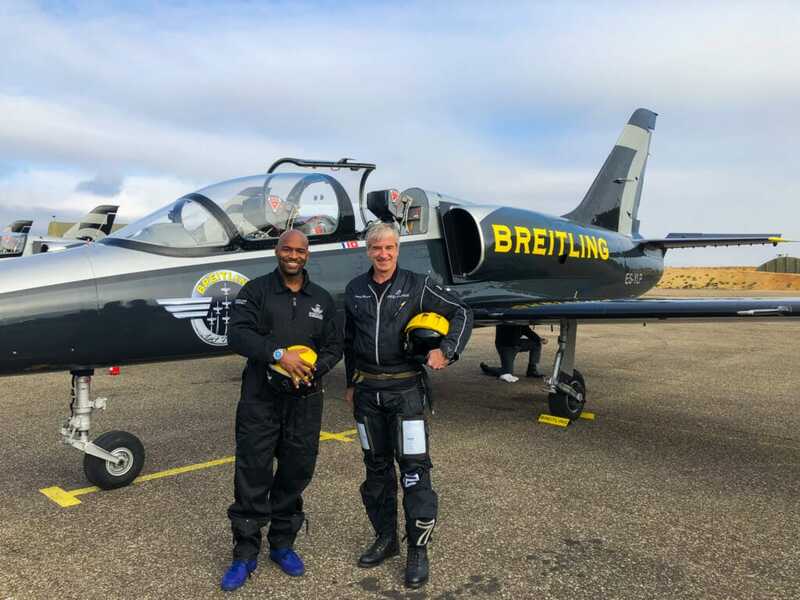 If you’re a Breitling customer and are interested in flying with the Breitling Jet Team, send me a DM on Instagram @worldwidenate and I can put you in touch the dream makers. Nathan Fluellen is the creator and host of the award winning travel and lifestyle web series, “World Wide Nate,” the quintessential guide to living a global lifestyle, has been traveling the world since 2004 and in that time, has visited more than 50 countries and 6 continents. He’s currently looking for his next thrilling, travel adventure.